And I could care less. I'm sorry but I am totally a Barnes & Noble girl. I did go over to Borders on Sunday for the big blowout savings, and was sorely disappointed. The "savings" for their everything must go sale is the same discount I get at Barnes & Noble for being a member. Not just that but a lot of the "savings" were a regular discount for non-members at Barnes & Noble. I did wind up buying 2 blurays for the hubby to realize the next day that yet again I was misled by their "savings" and spent the same amount I would've at Barnes & Noble. The only thing I do slightly care about is that we have lost another brick and mortar store. I'm a paper reader, not an e-reader. I prefer books to e-books. The last email I did receive was a little more honest about the savings it said 20-40% off, instead of the everything must go up to 40% off (see the misleading sizes?) email I first received. 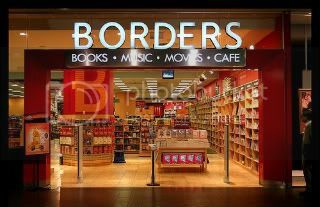 I was not a huge Borders buyer, but the closing makes me feel bad. Not so much for them, but because all the publishers (specially the small ones) who won't get paid after Border's bankruptcy claim. But like you said, we still have Barnes and Noble, and in my case a bunch of other independent bookstores in NYC. P.S. Love your blog's theme. I'm stealing your button. Hydration, are you drinking enough water?